Reporting Under “The Sheen Rule” ing while cleanup efforts were underway. There is a common misperception that And, since the ? uids were readily biode- the Coast Guard approves oils based on gradable and minimally toxic, there was the oil not leaving a sheen. Under the le- no long-term negative effect to the eco- gal authority of the CWA, the Discharge system. In actuality, the Coast Guard does not longer need to choose between perfor- approve, recommend or specify ? uids, mance and sustainability. By embracing nor does it approve or recommend any EALs and understanding regulations, it testing procedures. That said, while dis- is possible to improve water quality and charges of biodegradable hydraulic ? uid safety while achieving signi? cant costs must be reported, agencies are required to savings even in the face of spills – a ma- evaluate environmentally acceptable so- jor win-win. lutions differently than petroleum based oils. 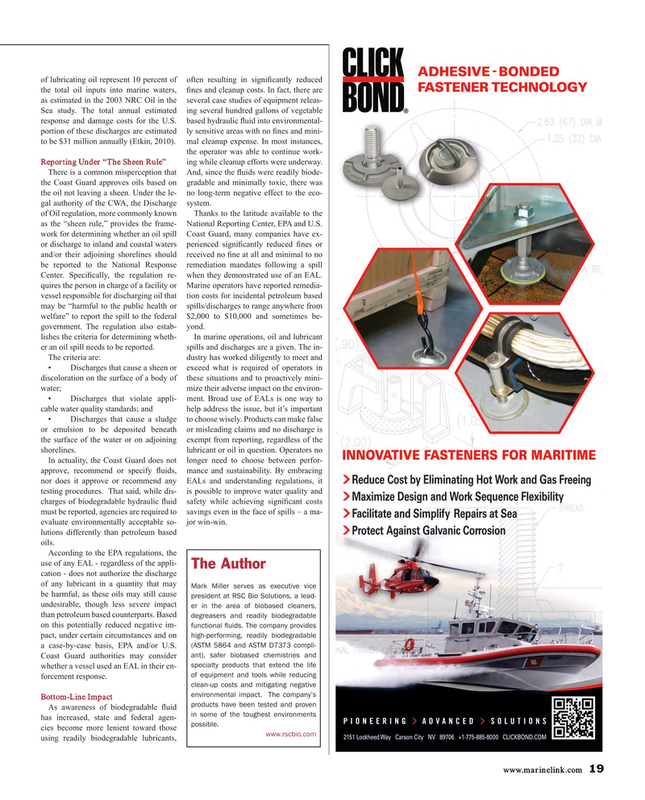 Coast Guard authorities may consider specialty products that extend the life whether a vessel used an EAL in their en- of equipment and tools while reducing forcement response.